An archaeological dig in Turkey has uncovered a large number of clay tokens that were used as records of trade until the advent of writing around 3,000 B.C. But the newly found tokens show the rudimentary accounting system didn’t die out with the invention of writing, and persisted for at least another 2,000 years. 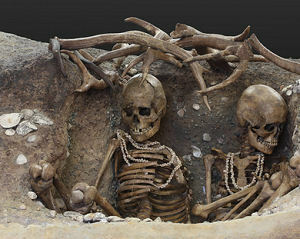 Lead archaeologist John MacGinnis (University of Cambridge) compared the discovery to the continued use of pens in the age of the word processor. 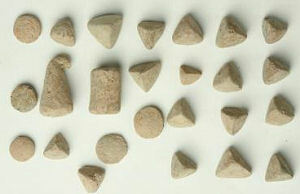 The tokens – small clay pieces in a range of simple shapes – are believed to have represented units of various commodities such as livestock and grain. These would be exchanged and later sealed in more clay as a permanent record of the trade – effectively, the world’s first contract. The system was used in the period leading up to around 3,000 B.C., at which point clay tablets filled with pictorial symbols drawn using triangular-tipped reeds begin to emerge: the birth of writing, and consequently history. From this point on in the archaeological record, the token numbers dwindled and then disappeared; leading to the assumption that writing quickly supplanted the token system. However, recent excavations at the site of the ancient city Tushhan, a provincial capital of the Neo-Assyrian Empire, have unearthed a large quantity of tokens dating to the first millennium BC: two thousand years after “cuneiform” – the earliest form of writing – emerged on clay tablets. The tokens were discovered in the main administrative building in Tushhan’s lower town, along with many cuneiform clay tablets as well as weights and clay sealings. Over 300 tokens were found in two rooms near the back of the building that MacGinnis describes as having the character of a “delivery area.” Types of tokens ranged from basic spheres, discs and triangles to tokens that resemble oxhide and bull heads. Archaeologists say that, while cuneiform writing was a more advanced accounting technology, by combining it with the flexibility of the tokens the ancient Assyrians created a record-keeping system of greater sophistication. “The tokens provided a system of moveable numbers that allowed for stock to be moved and accounts to be modified and updated without committing to writing; a system that doesn’t require everyone involved to be literate,” MacGinnis speculates.